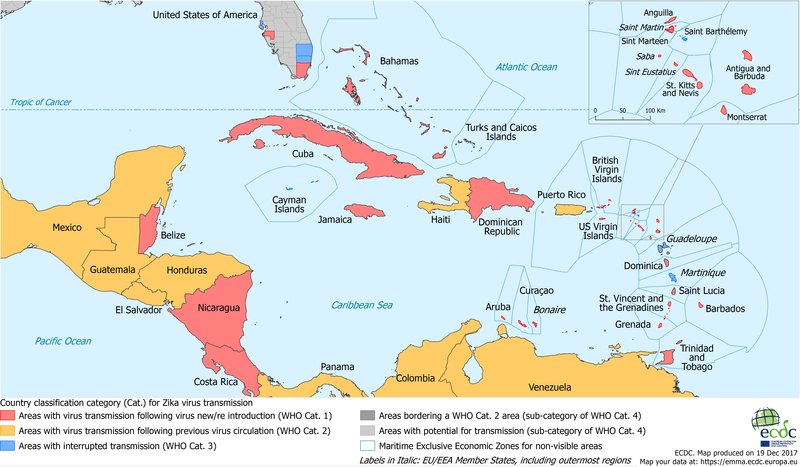 Information on the level of Zika transmission is useful for public health professionals to evaluate the level of risk for people who may be planning to travel to or are recently returning from areas with possible local transmission. The information is updated at least once a month. It is also updated each time a new country reports local vector-borne Zika virus transmission. The information is provided to aid diagnosis for returning travellers, especially pregnant women with travel history during pregnancy - returning from countries and territories that have recently experienced or are currently experiencing local active Zika virus transmission. Latest maps on the Zika transmission worldwide, to support health professionals in evaluating the risk of infection for travellers, especially pregnant women, returning from affected areas.